Disruption vs. Innovation: Is There Really a Difference? The last 5 years have been the hey-day of disruption. We’ve seen Airbnb turn hospitality on its head, Oscar rock the health insurance world, and Snapchat change the social media game forever. But what makes what these brands have done any different from what you do with every product launch or new service you offer? Is it not just innovation – but on a bigger, further-reaching, more lucrative scale? For sure, innovation can be successful and profitable, too, but disruption isn’t just about dollar signs or fancy new offerings. It’s about changing the very landscape it operates in. Think of it like this: A disruption is always an innovation – it’s new, different and never been done before. But an innovation? That’s not always a disruptor. In fact, very few ever are. Simply put, innovation is change. Now, usually this change is a positive one – something that improves an already existing product or service, or one that makes things better, easier, more convenient or more affordable for the end user. A good example is the Keurig. While not a game-changing disruption, the Keurig was certainly an innovative step up from the old Mr. Coffee of days old. Instead of being forced to brew a whole pot, risking 5 cups of precious black gold getting poured down the drain, caffeine lovers could use the Keurig to get a quick, one-cup fix. It was simple, effective and a big improvement in the convenience arena for most users. But was it a disruptor? Definitely not. Basically, disruption takes a current market (or a technology or industry), and replaces it with a different one – usually a more efficient, effective and faster one. There’s also a large amount of destruction involved in disruptions. In order to create a new landscape, the disruptor first has to tear down what already existed – making those products, services or even the entire industry it operates in a moot point. It might be a hard pill to swallow for non-disruptors in the sector (and a costly one as well), but in the end, disruption usually means a better product or service on the whole. And if others can catch up, that’s good for everyone involved – especially the customer. Are You Disrupting or Innovating? Both disruptions and innovations can propel your business forward, but if you really want to make an impact on the marketplace (and eliminate any competition), disruption is the only way to go. Want to make sure you don’t fall victim to unforeseen disruptors in your industry? Check out my last post on protecting yourself from disruption – and becoming a disruptor yourself. We’re living in an age of disruption. Companies like Uber and Lyft turned the transportation industry on its head, while artificial intelligence is doing the same for the brick-and-mortar retail world. It’s a time of change and growth. And the only thing that’s predictable anymore is that nothing is predictable anymore. For business owners, that can be pretty scary. It basically means that no matter how long a brand has been around, how much business it’s done or how much it’s loved by customers, there’s no longer a guarantee of success. At any time of any day, someone – or something – could come in a change the game, and all past assumptions go out the window. Do you just sit back and wait for the impact? Or is there something you can do today – right now – to help protect your brand for potential disruption? Don’t want disruptions to catch you off guard? Then try to predict them. Put together a team of your most creative, innovative, outside-the-box thinkers, and ask them to simply brainstorm. What are the craziest things that could happen in your industry? What amazing things – if there were no financial, geographical or technical boundaries – would they want to see your company do or produce? Tell them the skies the limit, and see what they come up with. Odds are, even their most far-fetched ideas are already in the pipeline somewhere on the globe. Disrupt. If you don’t want disruptors to hurt your business, become the disruptor yourself. Be the one who takes your competitors down a notch and catapults your industry to a new level that customers never imagined. Hire innovators and thinkers who can push your products and services to the limits, and never be satisfied with the status quo. Work outside the box, kick conventional ideas to the curb and don’t ascribe to it-worked-before-it-will-work-again model of business. Make constant evolution a mainstay of your organization. You never know when disruptions will hit, so start taking steps today to protect your brand from potential disruptors in the midst. Need help? Want to be the disruptor in your industry? Contact Haley Brand Intelligence today. In this day and age, having a brand that looks cool is no longer enough. If you’re trying to build up a passionate, fervent following, your company needs to stand for something – to say something and have a purpose. This is especially true if your target demo is the Millennial. This unique audience is looking for more than just a company with great products. They’re looking for a cause to support. And as a brand, that’s just what you should give them. But how do you position your brand to do that? How do you give a nonthinking, nonfeeling entity a purpose, values and a voice? Well, it’s certainly not as easy as other aspects of branding are. You can’t just hand it off to a great designer and wait for a killer logo to hit your inbox. It’s a bit more complicated than that. Know your audience. What do they care about? What issues are important? What do they like, dislike and find important? Your purpose needs to tap into this. Build a purpose around that audience. Forget designing a logo that fits your demo’s likes and dislikes. Instead, focus on building a brand lifestyle and purpose around those factors. Targeting the surfer type? Create a lifestyle around your brand that’s cool, calm and relaxed. Trying to hit up the more formal, professional buyer? Build a brand lifestyle that’s organized, high-tech and forward-thinking. That lifestyle is your purpose. It’s what customers will get behind, believe in and get excited about. Stand up for that lifestyle. Find ways to promote that lifestyle, as well as stand up for issues that matter in that lifestyle. If you’re targeting the surfer type, as in the last example, why not donate X percent of your proceeds to clean up California beaches? Or if you’re targeting the business-type, host an event or tradeshow that can bring together all the vendors and services they might need to be successful. Get creative! Be authentic and consistent. Let your purpose permeate all that you do – and be authentic about it. Work it into your social media, your customer services and even your internal culture. Make it a part of your everyday conversation around the water cooler and with customers. Let it be the driving factor for all that you do. Does your brand have a purpose? What does it stand for? What lifestyle does it offer your customers? If you’re not sure, it may be time to take a second look at your branding strategy. Want help? Contact Haley Brand Intelligence today. One of the biggest buzzwords in marketing today is “Millennials” (a term defined as consumers between the ages of 18 and 33, also known as Generation Y). Every time you turn around, everyone seems to be talking about Millennials. Our fascination with the current largest generational population is a global event. But what is it about this group that is so captivating and how do we connect with them on a more personal marketing level? This group of up-beat, optimistic go-getters see the world from a very different perspective than the generations before them. This is the first group to have been truly born in and grown up with technology. Rare is it to find a Generation Y member who is not within arm’s reach of at least one piece of technology (smartphones, tablets, mp3 players and even communication watches). This group of Star Trekgroupy offspring walk around with the world at their fingertips and view themselves as part of a global collective. Millennials are active on their mobile devices constantly throughout the day. If you want to reach them, you simply need to create campaigns that are honest, speak their language and are available 24/7. Engaging a Gen Y group member is about storytelling with a message that meets their needs – that’s the way to stand out in their world of constant messaging and multitasking informational digestion. 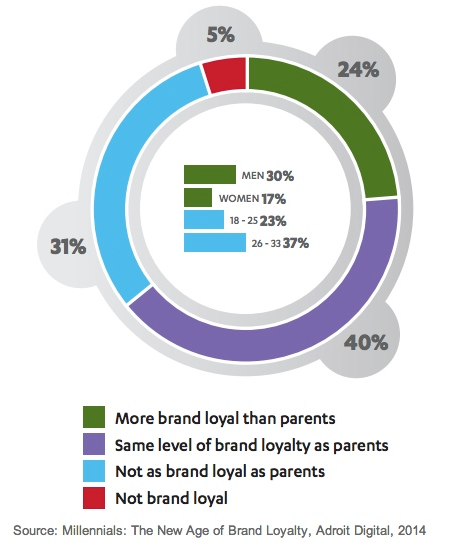 An estimated 64% of Millennials say they feel at least as much brand loyalty to their favorite brands as their parents do to their own favorite brands, according to a recent report from Adroit Digital. This report, based on a survey of 2,000 U.S. Millennials, found that 40% of them say they feel the same level of loyalty as their parents, and 24% say they feel more. Less than one-third admitted to feeling less loyalty or none at all. Understanding the Millennial mindset is only half the battle. The other strategic element is all about location – be where they are when they are ready to hear your message. While television is still king (approximately 70 percent say this is where they are influenced the most), a large number list social media and online engagement as their top line of incoming information. Blogs, videos and other sharable content are elements that marketers can create and place in the path of a Millennial. And unlike television or radio, which must select when it will be available, online content is something that is available constantly, regardless of the day or time. This “always open” medium is playground in which the members of Generation Y spend their time and where marketers must be in order to connect with them. When it comes to finding customers, many companies spend a lot of time focusing on strategies for acquiring new customers but don’t put as much energy into retention strategies. However, putting strategies and programs in place that allow you to not only foster but to also develop a long-term relationship with your customers is one of the best ways to impact your bottom line. Turning your one-time or annual customer into a brand advocate will both strengthen your sales and grow your brand’s online presence. In today’s market, delivering the basics on products and services is a requirement in order to retain any consumer. However, companies who excel, oftentimes the most forward-thinking ones, have figured out that by surpassing the status quo, they not only surpass consumer expectations, they create experiences worth sharing. Consumers who have an exceptional experience share with other consumers. This sharing of an experience by one often leads to new customers – just as the sharing of a negative experience often turns potential new customers away. But don’t just rely on word of mouth. Give your customers a platform in which they can share with others. Encourage testimonials online, send out follow-up emails after they’ve spoken with someone from your company, and ask questions on Facebook and LinkedIn about their experiences. Study after study shows that customers who spend the most aren’t always the ones who generate the greatest value when it comes to referrals. For your lower-spending customers, make sure they have a reason to share your story and that they have the full story. Create a blog, open a forum, and encourage customers to share online about your products and services. Develop a robust “About Us” on your website that tells the story of your company and create a section that shares the everyday life of your company with your consumers. Adding photos or videos to your website is a great way to personalize the experience and gives your brand advocates sharable information. Not every customer has what it takes to become a brand advocate. Want to know who to target? Look for customers that fill out your surveys, return email questionnaires, and provide feedback about your brand, service and products online on social platforms. Once you’ve identified this group, invite them to provide a testimonial, online or video. Also give your brand advocates a bit of additional love with promotions, early-release purchase opportunities and words of appreciation. Big data is the large collection of data sets that collects, captures and curates information from the Internet. It’s the technology the government uses to track the spread of diseases in order to stop it from further infecting people. It can see the trends in congested traffic areas and address the problem to relieve those areas. It’s also the same technology companies like Amazon and Google use to improve the interactions users have with the Internet. Including big data in market strategies like inbound and outbound marketing is used for lead generation, lead nurturing and retargeting. This is accomplished by meeting the demands of the consumers in order to make their online experience that much better. Marketing tactics shouldn’t necessarily feel like tactics, but like conveniences – like your company is working with the Internet to make their life better. With inbound marketing, the consumers are already coming to you. Implementing data sets to track what kind of information those consumers are looking for, you can make their experience better. Cut their search short by meeting them halfway, already with the information they need or are interested in. Outbound marketing has been around for much longer; however, it is the more evasive form of marketing and is harder to determine how effective it actually is. On the Internet, outbound marketing takes form in banners, created by the cookies dropped on a webpage visit. These banners will follow the consumer around, everywhere he or she goes on the Internet. First, you must curtail your data collection to only receive data that’s relevant to your business strategy. Amazon, for example, uses big data to generate product recommendations for their consumers. They receive the information of what the individual likes and can make further suggestions based on those products. A business should figure out what kind of data they need to respond to meet the needs of their consumers. From there, to make inbound and outbound marketing work, efforts must be focused on analyzing data. The data collected from your websites and consumer trends is only as good as how it’s interpreted. It’s important to invest time in the information collected and take action. Living in luxury has become a symbol of social status, leaving the thirst for the latest and rarest hard to quench. People are more willing than ever to pay for products based solely on brand, status or experience. Connecting with this market group proves difficult because on the one side you want to attract consumers to your product in order to make sales, but on the other side you want your product to maintain its high value. If the product is too obtainable, it loses its uniqueness and perceived higher value. Marketing luxury is further challenging because a key component to luxury lies in the experience itself. Somehow, luxury brands need to create an experience for their consumers, something to differentiate themselves from other similar products. They must position themselves in a way that shows the unique and spectacular qualities of their luxury brand experience. The top three aircraft manufacturers, Gulfstream, Boeing and Airbus, are classic examples of marketing different aspects of their products to appeal to a variety of consumers. All three aircraft manufacturers have extravagant interiors and similar onboard features and capabilities, so they’ve had to establish a marketing platform to further differentiate them. Boeing and Airbus jets are similar in size and both are passenger planes with the ability to convert into business jets. Boeing and Airbus aircraft allow the customer to send their planes to completion centers to receive client-specified customized interiors. These planes allow for bedrooms, conferences rooms, bathrooms, media rooms and whatever else the client imagines. As much personalization and luxury as desired can go into the interior. Airbus goes as far as to call their planes flying palaces. It takes meticulous market planning on their part to create a different experience for the two, and this is where pedigree and performance define a brand. Boeing has its pedigree – they’ve been manufacturing planes longer and have consistently built a solid product. People who go with Boeing are buying into their long-trusted name, their history of success and their luxury aircraft designs. Airbus focuses on performance, continually improving upon what they have created. They are always testing new technology and working on increasing their energy efficiency in order to attract customers who are concerned with having the most modern form of travel. Now, this doesn’t mean that Airbus doesn’t have a solid history in building planes, nor does it mean Boeing isn’t energy-efficient. They have simply chosen to market themselves in different ways, and the market has responded to their differing marketing platforms. Gulfstream has a little more wiggle room for creativity in their marketing because they are the only of three brands that specifically builds business jets. They are built for speed using the Rolls-Royce jet engines; travel time in a Gulfstream is significantly shorter. In fact, their product description states that, “if time is money, then that’s money in the pocket.” Its unique experience is its ability to get you back on the ground faster. Their interiors are luxurious and made by Gulfstream, but there is less opportunity for personalization. There are set layouts and preset fabric and color palettes. This is not to say they aren’t luxurious; their focus just isn’t on making the plane a home.